In my professional career, I have had the opportunity to visit three fistula hospitals, in Mali and Ethiopia. The challenges around unequal access to care stare you down in these places. Intravenous bags are held up by sticks in some cases, and each woman’s story is an exercise in heartbreak. Today, on the second day of the Global Maternal and Newborn Health Conference in Mexico City, I had the opportunity to learn more about a new kind of fistula complication that is emerging. Dr. Lauri Romanzi, who spoke at the Wilson Center in July and is project director of the USAID/EngenderHealth Fistula Care Plus Project, explained how increased access to cesarean sections without regard to quality of care is causing an increase in iatrogenic fistulas, a form of fistula unintentionally caused by a health care provider. Iatrogenic fistulas are sometimes caused by inexperienced clinicians who are thrown into situations with many patients. 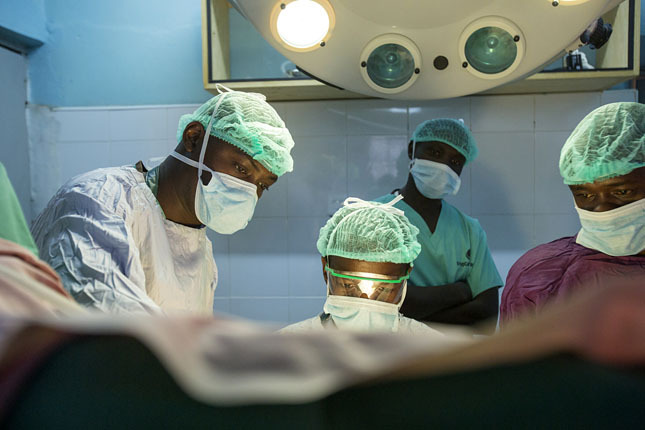 According to research conducted by Dr. Thomas Raassen, a surgeon for the non-profit Operation Fistula, more than 13 percent of fistulas in 65 hospitals across East Africa and Asia over an 18-year period were iatrogenic. Raassen stressed the importance of better training (some medical officers receive only two months of instruction) and suggested staff should perform cesarean sections under supervision before they are posted to hospitals. Cesarean sections are “easy until they aren’t,” Romanzi said. It’s major surgery, and mistakes can cause a lot of damage. Raassen also stressed the need for cesarean section alternatives, especially in the unfortunate case of a dead fetus after days of obstructed labor. It’s not just an increase in poor quality cesarean section surgeries, said Dr. SK Nazmul Huda, a project manager with Fistula Care Plus in Bangladesh. He shared data from the National Fistula Center and three major hospitals in Bangladesh indicating that 27 percent of fistulas were iatrogenic from 2012 to 2014, but three quarters were caused by poor quality hysterectomies. Lack of access to quality care spans across a woman’s life. Dr. Ganda Sanda of Niger’s Hopital National de Lamorde Niamey highlighted issues around classification and data. Should fistulas caused by sexual violence or genital cutting be considered iatrogenic? How do we prevent these causes and prepare doctors to deal with them? Romanzi stressed throughout the session that fistula is an indicator of inequity. Fistulas are on the rise at a time when more women have access to cesarean sections and hysterectomies, which should be a good thing. But the poorest women are having a much harder time accessing high quality care. I look forward to learning more about equity and quality of care issues tomorrow. Sandeep Bathala is reporting from 2015 Global Maternal and Newborn Health Conference in Mexico City for the Wilson Center, Maternal Health Task Force, and UN Population Fund. To read what global maternal health leaders are saying about the conference and what we need to do to end preventable maternal and newborn mortality, check out the Crowd 360 digital hub and subscribe to the conference Daily Digest. Photo Credit: Fistula repair surgery at the Gynocare Fistula Center and Maternity Center in Eldoret, Kenya, courtesy of flickr user Dining for Women.